The Imagineering process is magic. And art. And science. Imagineering is a process and it’s a system that you can apply to your life and creative work. Louis Prosperi is a fan of Imagineering and has spent years studying and documenting the art of Disney theme park design. 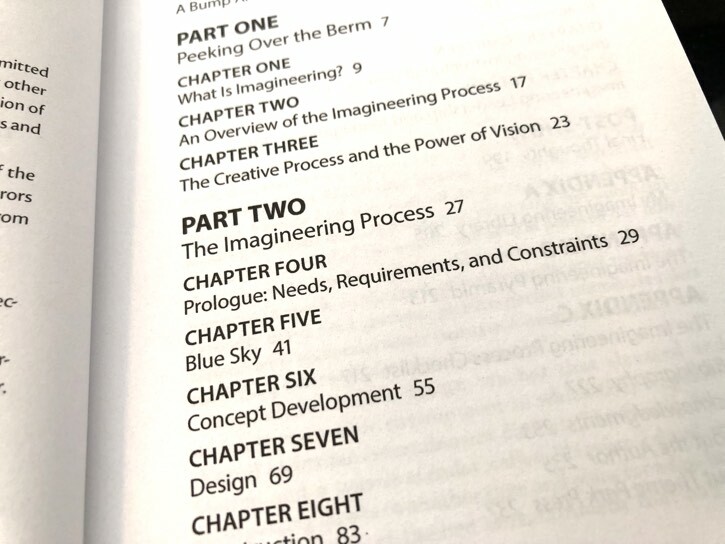 He sent me a review copy of his latest book, The Imagineering Process: Using the Disney Theme Park Design Process to Bring Your Creative Ideas to Life, which is the second title in his Imagineering Toolbox Series (I reviewed The Imagineering Pyramid, here). 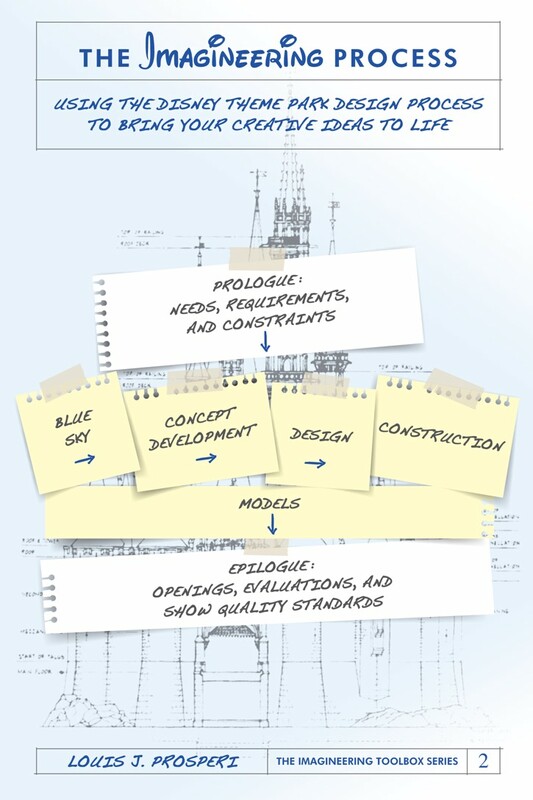 The Imagineering Pyramid (book one) spotlights using Disney theme park design principles to develop your creative ideas. The Imagineering Process focuses on the steps to bringing your creative ideas to fruition. The book is divided into three parts with fifteen chapters that take you step-by-step through the development of bringing your creative ideas to fruition. Louis does a tremendous job of distilling a daunting process into one understood by the general reader. The Imagineering Process is also a great title for anyone who has to work with a creative team. Louis offers insights into the creative process from the Disney organization, other creative fields and his own endeavors. In some cases, the anecdotes are from Louis’s own personal experiences. What I found most valuable about the book are the concrete examples that Louis offered. They helped to solidify the concepts as well as share real-life examples that you can follow. In some cases, the examples are famous Disney attractions, but Louis also shares projects that he worked on that are more relatable. Each chapter is constructed like the book; he introduces the topic, gives examples, shows us how to implement them and wraps up the chapter with a checklist and questions. Louis sends us on our way with all the tools we need to take our creative ideas and implement them in our personal and professional lives. The Imagineering Process: Disney Fans! Just like in The Imagineering Pyramid, Louis proves he’s done his homework and provides a few gems for the Disney fans and historians. At the back of the book, you’ll find Appendix A and a Bibliography. Appendix A is Louis’s Imagineering Library. It is seven pages of books, periodicals, websites and other sources that Louis has collected over the years about Imagineers and Imagineering. Trust me: it’s an incredible list and you won’t find a better one outside of my personal collection. The Bibliography is a five page list of all of the resources that Louis used in creating the book. Sadly, like most Theme Park Press titles, Bob McLain (the editor), doesn’t believe in endnotes or footnotes, which makes it difficult to verify what his authors are purporting. The lack of notes also diminishes the historical value of the titles for future researchers. I support Bob and what he’s doing, but I wish he would let his authors notate their sources. This really is important. The Imagineering Process is a must have for anyone working in a creative industry or wants to get their creative juices flowing. The book is not full of exercises (which is good), but it’s full of solid advice and real-world anecdotes that will help you down the (often scary) path of creativity. People who manage creative groups will also find this book very helpful. Louis peppers the book with solid advice on managing creative projects from the perspective of a team leader. This book is a great addition to a manager’s toolbox! Are You Going to Pick Up The Imagineering Process?